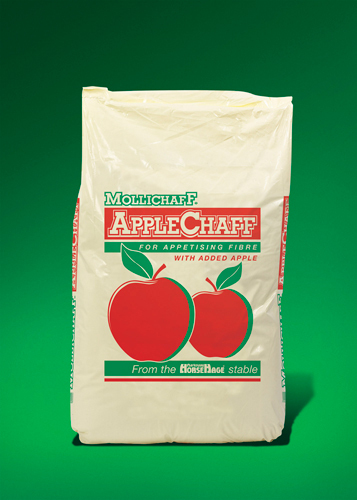 Mollichaff Applechaff is a dust-free, low sugar chaff with the natural goodness of apple. Adds fibre and bulk to horses and ponies' diets, prolonging feeding time and aiding digestion. Made from high quality straw, dust-extracted and lightly mixed with low sugar molasses, AppleChaff contains natural apple pieces and apple flavouring to give it a very appetising taste and smell. It is therefore ideal for fussy feeders, or simply to add variety tot he diet. AppleChaff can be fed alone or as part of a forage ration, but it is more usually added to concentrates to prolong feeding time, prevent bolting of feed, and help reduce boredom. It also promotes good digestion by stimulating the production of saliva and slowing down the passage of food through he gut. AppleChaff can also be used as a base to mix with supplements or medication when the horse or pony is not normally fed concentrates.